What is a UPS and why would you need one? 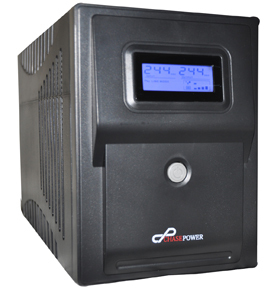 A UPS (Uninterruptible Power Supply) is a very simple and yet important device that every computer owner should consider purchasing. It is simply a large battery (round half the size of a car battery) that plugs into the wall power supply. You then plug your computer monitor, desktop or notebook computer into the UPS’s many power board style sockets and the UPS then provides the power to all your devices. I am sure you may well be asking, “why don’t I simply plug my computer or monitor directly into the wall socket?” and that is a valid question. Computers have many parts that are very sensitive to fluctuations in electricity supply. Most of the time the electrical current coming into your house or office is usually very consistent but we have all experienced violent thunder storms, brown outs, power spikes and even power outages. While rare nowadays, these significant fluctuations in the power can be extremely harmful to computers. Have you ever notice the lights dim or flicker for a second when your fridge or air conditioner turns on? Your computer notices these small fluctuations in the power too. The UPS keeps its internal battery constantly charged from the mains power supply then delivers a steady and consistent flow of electricity to any devices plugged into it. This completely protects your devices from the negative effects of power outages, brownouts or power spikes. Many UPS’s even come with a “devices warranty” meaning if the product should fail to protect any device plugged into it, they will pay to replace it free of charge. The most common parts affected by power fluctuations are the computers power supply, motherboard and of course the Hard Drive, where all of your critical data is stored. Even something quite simple as turning off the computer incorrectly by using off button on the PC or just pulling the power cable out of the back of the PC tower can often cause loss of data. UPS’s are available in many different types and can range in price from $50.00 to several thousands of dollars for a commercial application. On average a UPS’s starts around $50.00 to $150.00 depending on how many devices that you might need to plug into it. Most users will plug in their computer, monitor and a router so that if the power does go out, they can have an additional power period available ranging from 15 to 30 minutes to finish their work on and properly shut their systems down correctly. Constant and consistent supply of clean power to all connected computers, monitors and routers. A device warranty, protecting your devices in the event the UPS fails. Included software monitors your computer so if you are out of the house and your power goes out, it will save and close all of your documents ie: word, email etc and shut down your computer safely. With automatic self-testing procedures this ensures the detection of potential problems by frequently testing of the UPS components. Keep working during power outages for up to one full hour. Have your local I.T professional install a UPS and load the included software. UPS’s usually come with a software disk that runs diagnostics and continually checks the operation of the device. Several UPS devices will even record and event such as a fluctuation or outage in a log or diary.